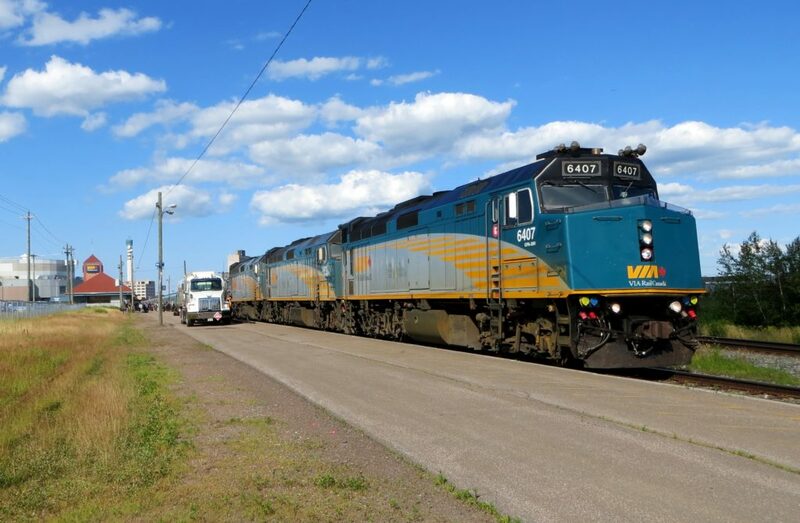 Transport Action Atlantic is asking why it is taking so long for VIA Rail and the Government of Canada to deliver on an outstanding promise to improve frequency of passenger rail services in the Maritimes. Today is National Railway Day – the anniversary of the last spike ceremony that marked completion of Canada’s continuous rail link from coast to coast on November 7, 1885. “It’s a very appropriate occasion to pose this question,” says Ted Bartlett, president of the regional public transportation advocacy group, “and not just because it’s a date that was so important in the development of Canada’s nationhood. It was three years ago this week that VIA’s CEO unveiled a plan to reintroduce regional service within Nova Scotia and New Brunswick, using the same type of rail diesel cars (RDCs) that had been discontinued in January 1990 as part of sweeping cuts mandated by the Mulroney Government. His timeline called for the routes between Moncton and Halifax and Moncton and Campbellton to be operational by late summer or early fall of 2016. Bartlett acknowledged that the Government of Canada has committed a major investment to re-equip all of VIA’s aging rolling stock in the Quebec City-Windsor Corridor, but has shown little interest in upgrading service elsewhere. He added, however, that it would be unfair to blame the current situation entirely on VIA’s management team. “If our political leaders considered passenger rail in this region to be important, VIA as a federal Crown corporation would be directed to get on with it,” he said. Our elected MPs – all of whom belong to the governing party – should be insisting that the needs of this region not be forgotten. “VIA’s so-called ‘regional service’ using 60-year-old RDCs was not a concept that we wholeheartedly endorsed,” says TAA vice-president Ashley Morton. “We extended a lukewarm welcome to that announcement three years ago largely because it promised something better than the existing bare-bones service – a situation that VIA’s management now acknowledges isn’t meeting local needs. We also considered that regional service to Moncton might be a good fit with the Halifax commuter rail proposal. But our ultimate goal remains to have the Ocean restored to its former status as a daily through train between Halifax and Montreal. Transport Action Atlantic maintains that a well-marketed and better-equipped daily train could enhance ridership revenues to the point where they would cover the major portion of incremental costs, resulting in a greatly reduced subsidy requirement per passenger-mile and far better value for Canadian taxpayers. Analysis of figures released by VIA indicate that savings realized by the ill-advised 2012 decision cutting service to tri-weekly were negligible. Transport Action Atlantic is a regional advocacy group, promoting convenient, affordable, safe and environmentally-friendly transportation solutions in the four Atlantic provinces. The organization will hold its semi-annual board meeting in Dartmouth on December 1. The agenda will focus on urban, rural and intercity public transportation, with particular emphasis on new initiatives to restore and strengthen options that reduce dependency on automobile use. Transport Action BC is holding it’s 2018 Annual General Meeting and regular meeting on Wednesday November 7th. It will be at Waves Coffee shop on Howe St in Vancouver. From 7 pm to 9 pm. VIA Rail’s 2017-2021 Corporate Plan: what’s in it for Atlantic Canada? Early in 2018 VIA released their 2017-2021 Corporate Plan. These documents, released each year and looking ahead for the next five, offer a synopsis of the state of the railway and tend to provide insight into what VIA is looking at moving forward. In the last few years these plans have focused heavily on VIA’s need for new equipment, and some of the challenges (e.g. deteriorating on time performance on many routes, rising costs) and successes (e.g. ridership growth), as well as a look at their plans across the entire system. This latest corporate plan, which can be found in full online (http://www.viarail.ca/sites/all/files/media/pdfs/About_VIA/our-company/corporate-plan/CorporatePlan_2017-2021.pdf) has some specific items of interest for Atlantic Canada. There is a blurb describing the operation of the Ocean, which has some new phrasing this year. It reads: “During the holiday season, VIA Rail adds extra departures.” That is a change from past years, which used past tense phrasing (e.g. last year it said “during the holiday season, VIA Rail added six extra departures”). This seems to imply that the holiday frequency expansion is now considered a standard annual practice. This is further confirmed in the following section. One of the outstanding questions for the future of the Ocean is the state of the Renaissance equipment. VIA has been clear that the Renaissance sets being used in the Corridor are in poor shape and must be retired by 2021, and in a response to a question asked in their annual public meeting, they have now indicated that the Renaissance fleet in Eastern Canada will also be withdrawn by 2021. The Corporate Plan makes no note of this, simply including “Renaissance Ocean Fleet Upgrades, Renaissance State of Good Repair (Ocean Only)” in the section on equipment projects. Yet it now appears that the plan will be to re-equip the train with the very stainless-steel equipment that the Renaissance fleet displaced 15 years ago. VIA did report positive ridership figures over the holiday season, noting that the Ocean saw an increase again over the same period last year. Trains in the summer have been busy again this year, with long 20-car trains nearly or entirely sold out since late May. These trends are encouraging, but the question always remains about just how much VIA can do with their existing skeletal 3/week service, and whether they are truly providing useful public transportation in the region. Our Canada includes passenger trains…and it doesn’t end at Quebec City. 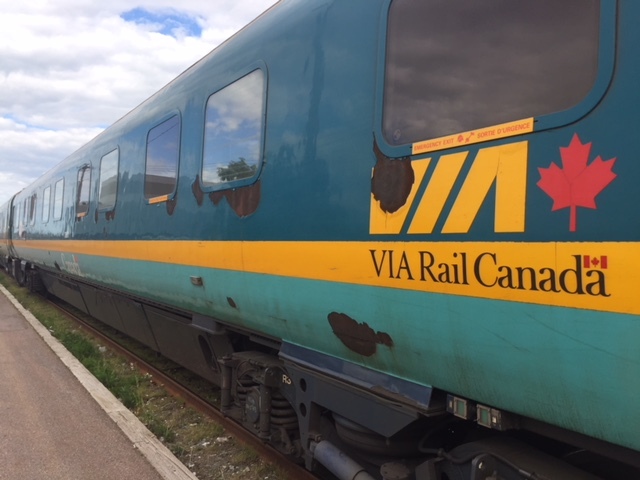 The troublesome British-built Renaissance cars used in VIA Rail’s downsized Atlantic Canada service were never designed for life in Canada, and are in urgent need of replacement. But Budget 2018 makes provision only for fleet renewal in the Quebec City-Windsor corridor. After four decades of neglect by successive federal governments, there finally seems to be some significant support in Ottawa for passenger rail. In certain parts of Canada – that is. That was the gist of a significant appropriation contained in the Trudeau Government’s Budget 2018, tabled on February 27. The first commitment to new rolling stock in 40 years promises a complete renewal of VIA Rail Canada’s aging and tired corridor fleet. No actual cost figures were given because of the pending procurement process, but it’s clearly an investment in the billion-plus category. VIA subsequently posted a summary of the fleet renewal program on its website, and on June 18 announced a short-list of four qualified suppliers that will have until October 5 to submit proposals. A contract is expected to be awarded before the end of 2018, with the first of the new rolling stock in service within four years. In short, the plan calls for 32 new bi-directional trainsets for use in the Quebec City to Windsor corridor. Primarily the new rolling stock will replace the so-called LRC equipment, built in the early 1980s, and now rapidly approaching the end of its useful life. Many LRC cars will need to be retired before the new orders are delivered. But the oldest equipment on VIA’s roster isn’t destined for the scrapyard. A total of 75 stainless steel cars originally constructed by the Budd company of Philadelphia – some dating back as far as 1946 – are getting a new lease on life. Built to last, they are being completely refurbished to modern standards, in the expectation they will continue in service for many years to come, primarily on VIA’s flagship train the Canadian. It’s all very positive news from a government that was quite outspoken on passenger rail while in opposition, but got off to a very slow start following its election in 2015. In fact, VIA wasn’t even mentioned in Transport Minister Marc Garneau’s mandate letter. And the first two budgets from the Trudeau Liberals allocated only miniscule amounts to study the requirements for fleet renewal and the dedicated tracks/high frequency rail (HFR) proposal. This time, though, there’s a solid commitment to proceed with renewal of the corridor fleet, although the government hasn’t gone beyond allocating $8 million for further study of HFR. But what’s not so encouraging about VIA’s plan and Budget 2018 is the absence of any reference to replacing the troublesome British-built Renaissance cars that are the tired workhorses of the Ocean – the company’s only remaining train in Atlantic Canada. Never intended for life in Canada, that equipment has not improved with age. One Renaissance trainset was out of service for some three months this past winter after a major electrical failure at Halifax in early January. 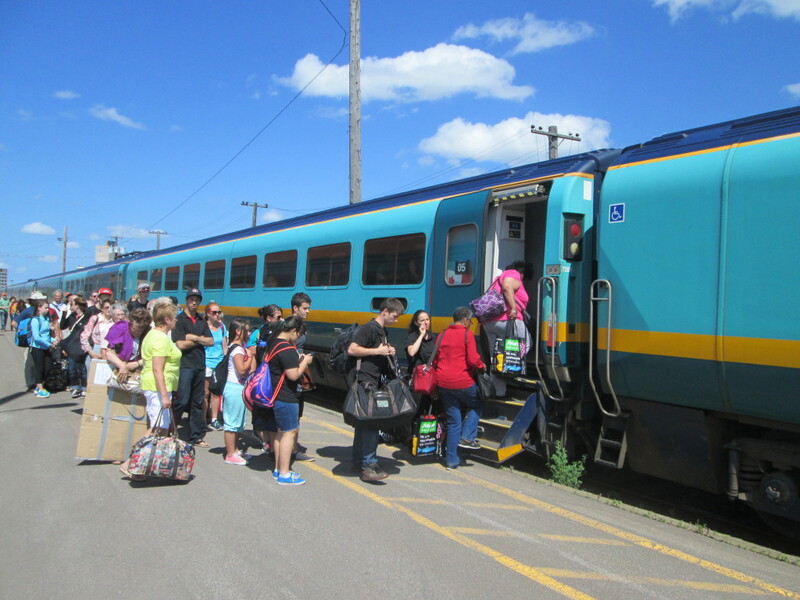 The passengers had to be loaded unto buses, and the train deadheaded back to Montreal for repairs. In response to questions asked during their annual public meeting, VIA has now indicated that the Renaissance equipment in Eastern Canada will be withdrawn from service by 2021, with plans to re-equip the service with stainless steel Budd equipment by the fall of 2020. How exactly that will work, given the limited availability of Budd equipment during the peak season, remains to be seen. The once-daily Ocean now runs only three times a week on a schedule several hours slower than 20 years ago. It simply isn’t adequate to sustain and build ridership, or even provide a useful service to Maritimers – a reality that VIA management now readily acknowledges. Transport Action Atlantic is unequivocal about what this region needs. Nothing less than a daily connection to that new and improved corridor service will be acceptable. Yes – our Canada includes passenger trains – and Canada does not end at Quebec City! TAA is using every opportunity to advocate with our regional MPs, municipalities, chambers of commerce, and provincial governments in our efforts to get everyone on board. Services to Atlantic Canada need new equipment, upgraded track, and faster schedules – and the time to plan for it is now. Passenger rail in Canada is on a roll – and we must be part of it!